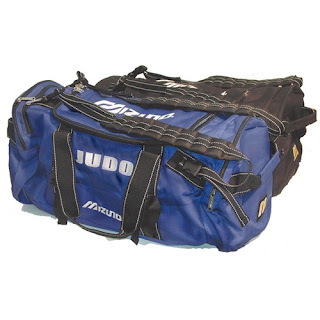 Mizuno's Gear Bag / Backpack - My current Judo bag is starting to slowly fall apart, and it won't be long before I might need to replace it. The bag I have now is actually a Callaway golf bag that my wife got from a vendor of her company. It's a great bag, nice and sturdy, but the wear and tear of shlepping wet double-weave gis in it for three years has taken its toll. A few of my friends have the Mizuno bag, and love it. It can hold a lot - up to two gis, and it seems to be pretty sturdy, but most of all, it will be a lot easier to spot on a baggage carousel at the airport. Swain Sports Roll-up Judo Mat - The folks over at Swain Sports have developed a roll-up Tatami that always lies flat when you roll it out. My basement (an ongoing project) is almost done, and this would be a welcome addition. They sell a 5' x10'x1.25" version of the mat which, although not big enough for Randori, might be good enough for me to use when practicing Kata moves, (one throw at a time) and perfecting my rollouts.